I got a pretty good response from my post on Up the Amp dupe (if you missed it you can find it HERE), so I'm back with another post to my Glamorously Savvy series. I love finding dupes to products. As I'm on a budget it's not always practical to spend $14+ on a shadow especially when there is a dupe for it at the drugstore possibly less than $5 =] So I know a lot of people missed out on the Naked palette, and apparently it's still in pretty high demand. Well if you missed it don't worry because there are plenty of dupes out there for the gorgeous neutral shades the Naked palette has. As you can see they are not EXACT but hey for what it's worth they are pretty darn close don't you think. The WNW palette I got for $1.99 and the Naked was $44 (I could be wrong, I forget it was awhile ago)...pretty big difference huh? Have you picked out any of these WNW palettes and what's been your experience with them? 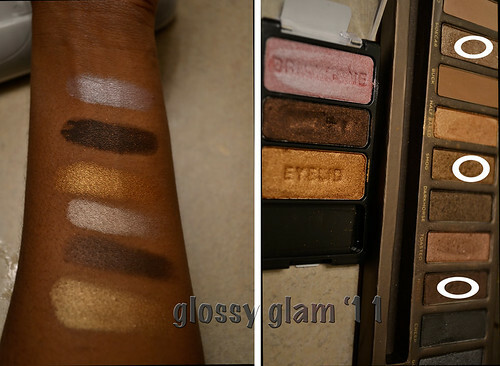 There's also a 10 color palette by nyx that is a dupe for the naked palette. I think its the 10 color runway palette and the color is champange and cavier. I believe the naked palette has about 11 or 12 shadows whereas the NYX palette has 10. Instead of paying the 44 for the naked you could pay up to 10 dollars for the NYX one depending on where you buy.